And Here We Go! : Cycle 2 Weekly Plans Review & Giveaway! Cycle 2 Weekly Plans Review & Giveaway! I love, love, love to plan and organize - you may already know this about me. And as much as I've enjoyed scouring the internet for good ideas for each week of Cycle 1, I honestly don't see myself having the time to do this for Cycle 2. Instead, I'm going to use Colleen's wonderful plans at Sola Gratia Mom! 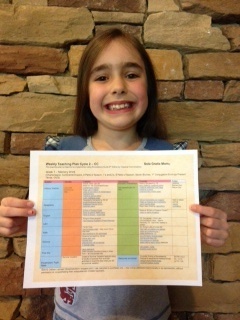 Colleen has Weeks 1-12 planned out with daily reading and activities. She also has included project ideas for Wonderful Wednesdays (which are so great; I'm seriously considering organizing a group like this for our community!). Click here to read all about the plans and to download a sample. Click here to read Brandy's review at Half-a-Hundred Acre Wood (Side note: Brandy's like the CC team coach or All-star, so I link back to her whenever I can. If you've never been to her site - it's really hard to imagine a CC mama never going there - you really need to check it out!). So, these are the plans that I personally am going to use for Cycle 2. I'll still search out books and links, but I really don't plan on spending hours each week trying to flesh-out CC in my own way. Why reinvent the wheel? I've followed her awesome blog all year, love her stuff, and have used her projects already in Cycle 1 - so I know these plans are the real deal. I'll add stuff here and there to fit our needs, but these plans are going to be the backbone of our year. And all I can say is Whew! What a load off of my mind! Colleen has graciously offered to give away a set of plans for Weeks 1-12 to one blessed reader. Would you like to win?! Simply leave a comment telling me how you're planning for Cycle 2. The giveaway will end on Thursday, May 2. Update: Congratulations to Taylor Y. for winning the plans! I received a free copy of this product for the purpose of reviewing it. I've received no other compensation. The views expressed are always honest and my own. These sound like they would be a great help. I'm doing lots of reading and lots of pinning trying to get a plan together! I wasn't planning on planning at all! I was going to do whatever you planned to do! It worked for me this year. I suppose I could follow someone else... I hope you keep blogging, though. I've really enjoyed getting to 'know' you and your sweet family! This will be our first year with CC. We are a foster/adoptive family with 6 kids ages 3 months-11 years. I have been more than a little nervous about making it all work. This planning set would be great to help us get started. I'd love to have these plans! We have been following her as well. As of our next CC session, we will have moved, started a business and (surprise) have our 4th baby.Any extra help I can get, I'll gladly take. Thank you! Oh, plans would be so helpful! I would love to use them. I would love these plans! Next year I am going to tutor an ABC class, so I am planning for that first. I want to make sure I have time to plan for my own child as well, and these plans would help me out immensely. I've followed her blog all year and her projects are fantastic! I tutored this year and found I had little left for my own at home.. this looks like an answer to prayer for next year. I would love these! Next year will be our first year in CC, so I haven't really started planning yet! So far I've been gathering ideas from wonderful blogs like yours and Pinterest. I'm going to tutor this year so I'd really like to win this set of plans! Thank you for all the wonderful ideas and resources. I've already began the book search for Cycle 2 and getting ready. I have started planning for next year:) I am using the mini book you made and love it as I can carry it with me to the library or used bookstore. Sola Gratia has been a great resource for me this year and I would love to have the Cycle 2 plans! Her ideas are great, along with yours. Love both of your websites. Would love to have her ideas for cycle 2! I'm gearing up to teach Essentials, so this binder would be so helpful for me to have a headstart on Foundations too! I would love to win these lesson plans! I'm due with our 3rd baby in July, so anything that will make next year a bit easier would be a blessing. Thank you for all the wonderful ideas and encouragement! I would love having all the work done for me - I have four kids, including a toddler, so life is BUSy but fun! Oh, girl, I don't blame you for wanting a break from searching out all of that stuff. But your posts will be missed! I've printed out your Cycle 2 flip chart and I've started pinning stuff for Cycle 2 on Pinterest. I hope to devote some time this summer to planning out some activities and getting more organized than I was last year. I'll also be doing some things week to week...like looking at some blogs for printables and ideas. I hope I can post some weekly stuff on my blog...mostly links, but I hope it'll be helpful to other CC teachers. We'll see how that plays out once we get going, though ; ). Thanks for the giveaway! I have not finished C1 as of yet, so help with planning C2 would be great! I only plan on looking at pinterest for now and your blog for now! This is my first go at CC, so I'm just trying to read as much as possible and research so I can plan our our year -- mostly Pinterest and blogs -- glad to discover yours! I have been scouring Pintrest feverishly for the past year pinning any and everything that will help me help my child (and other children...I was a sub this year). I plan to stop pulling double duty and make CC my core curriculum (in addition to math and English). This lesson plan is just what I need. I have actually been eyeing this for about a week now :-). Thanks to you and other moms that have laid the ground work for moms like me! This will be our second year of CC. I spent too much time on Pinterest in cycle 1 and would love to have something much easier to implement next year. I used Pinterest a lot for our first year that we are wrapping up now. I'd love to find something a little more efficient than that. Would love to use these! Would save me so much time!